Intimex Import Export Joint-Stock Company (Intimex Hochiminh), which was formerly known as Intimex Import Export Corporation, Hochiminh City Branch, was established in September 1995. After more than a decade of brand building and trade developing, from a small branch, Intimex Hochiminh has achieved a significant progress. Intimex Hochiminh officially became a joint-stock company on 1st July 2006 and now running ourself 5 branches in Binh Duong, Tay Ninh, Buon Ma Thuot, Nha Trang, Ha Noi and Can Tho. Today, Intimex Hochiminh has been honored in top 500 list of Vietnamese enterprises. Our import-export revenue and total turnover grow steadily year after year, from 20% to 50% annually on average. Particularly, we have made our name as a Vietnamese leading import - export companies in the field of coffee and pepper business. Intimex Hochiminh’s annual import-export revenue has reached 320 million USD; yearly total turnover is over 7.200 billions VND. Intimex Hochiminh also promotes domestic trade by setting up wholesale and retail networks and supermarket system. Especially, quality has always been a top priority at Intimex Hochiminh. The company has invested in The Pepper Processing Factory and The Coffee Processing Factory in order to produce high-quality products for domestic demand and export under the brand name of Intimex. For our long-term strategy, we will continue to stretch our brand name worldwide by exploring new markets, diversifying the import – export commodities; setting up more branches; rapidly expanding the wholesale and retail networks; strengthening international investment and cooperation. In recent years, all the achievements of Intimex Hochiminh have been acknowledged by many business awards given by Ministry of Trade and Industry, Ministry of Agriculture and Rural Development. In 2006, Intimex Hochiminh received the Business Excellence Awards for Export Achievement Enterprise organized by National Committee for International Economic Co-operation, E-Trade News in coordinating with other 53 Vietnamese standing agencies. Intimex Hochiminh also received the Excellence Award for Pepper Export Enterprise organized by Ministry of Agriculture and Rural Development. 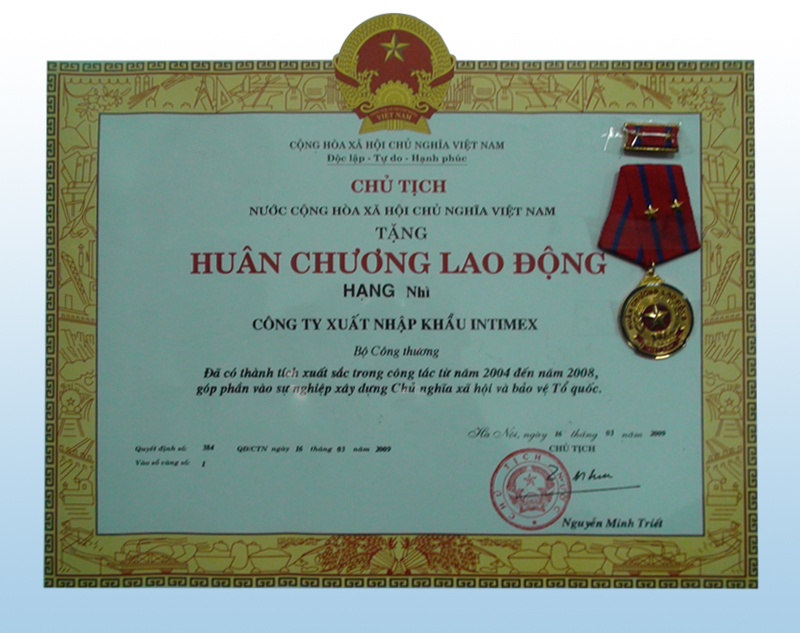 In 2007, Intimex Hochiminh won the “Top Trade Services Award 2007” in general trading field, presented by the Ministry of Trade and Industry and E-Trade News. Intimex Hochiminh also ranked among “Vietnamese Reliable Exporters in the year 2007” chosen by Ministry of Trade and Industry. At the same time, we also gained the prize “The Best Import Export Payment Partner” given by Vietcombank. in general trading field, presented by the Ministry of Trade and Industry and E-Trade News. Intimex Hochiminh also ranked among “Vietnamese Reliable Exporters in the year 2007” chosen by Ministry of Trade and Industry. At the same time, we also gained the prize “The Best Import Export Payment Partner” given by Vietcombank. In 2008, Intimex Hochiminh won the “Enterprise of Stable Development” Award given by the Ministry of Trade and Industry; was honored among the "Top 15 Outstanding Enterprises of Vietnam in the year 2008", chosen by the Ministry of Trade and Industry and the Cong Thuong newspaper. Intimex Hochiminh also received received the Excellence Award for Pepper Export Enterprise organized by Ministry of Agriculture and Rural Development. And the Intimex Hochiminh was rank 5th in the top 500 list of Vietnamese enterprises in 2008. Especially, Mr. Do Ha Nam, Chairman and General Director of Intimex Hochiminh is voted for Chairman of Vietnam Pepper Association (VPA) and Vice Chairman of Vietnam Coffee and Cocoa Association (VICOFA).